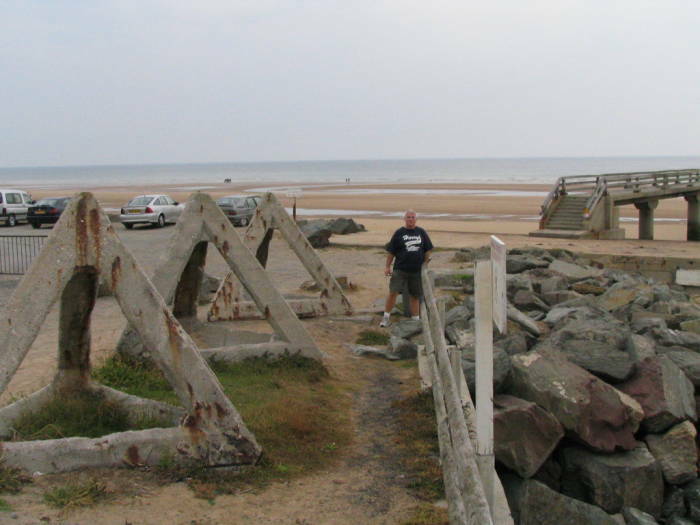 We're visiting the landing beaches and battlefields of the D-Day invasion of June 6, 1944. We flew to Brussels, rented a car, and drove across Belgium and France to Sainte-Mère-Église, where we found a place to stay. It was our base for exploring Normandy. 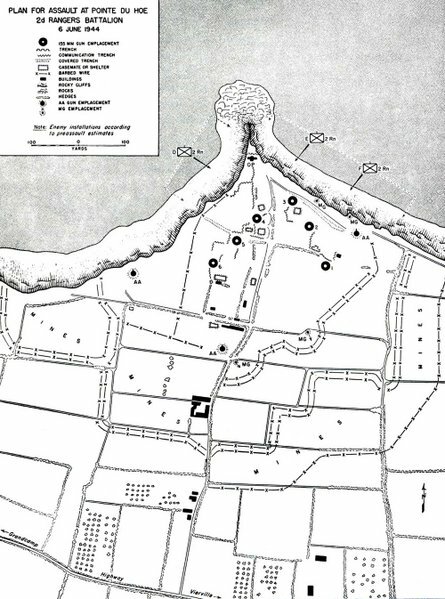 Below is a U.S. Military map of the area designated as Omaha Beach and its surroundings. The Douve Estuary and the town of Grandcamps-Maisy (see on a previous page) are to its west, near the left edge of this map. The terrain differed from that at Utah Beach. 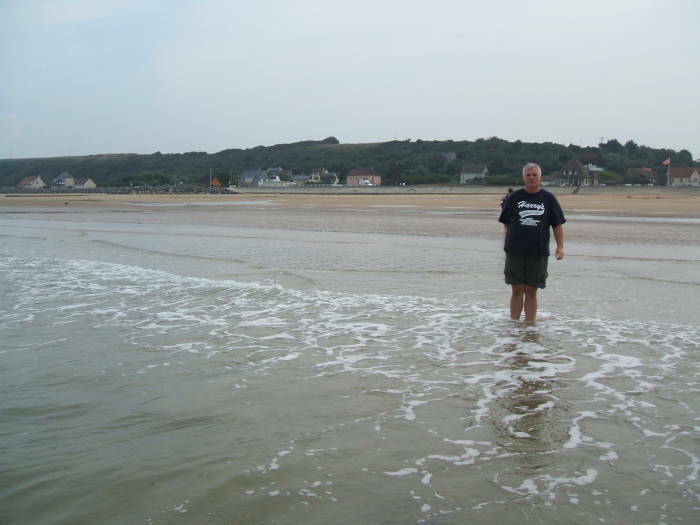 The beach itself still had a gentle slope, but it was steeper than at Utah Beach. 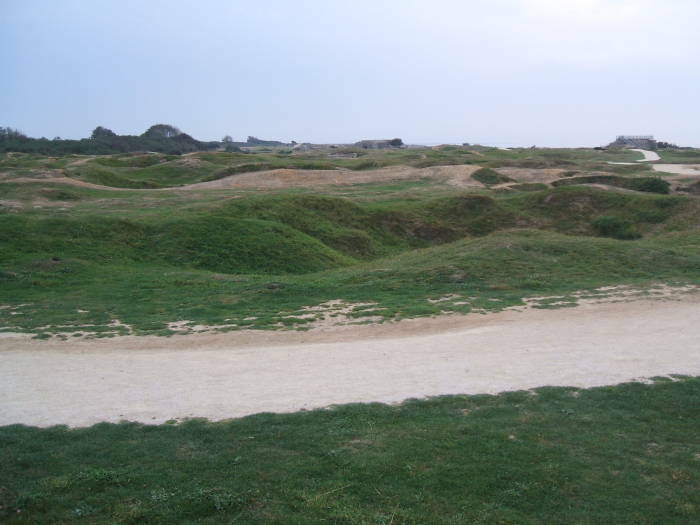 The low-water and high-water lines were only about 300 meters apart here, instead of a kilometer or more as at Utah beach. Moving inland from the waterline, you had to cross a slippery shingle bank, then there was a sea wall 1.5 to 4 meters high. Beyond that, very steep hills or, more commonly, bluffs, rose 30 to 50 meters. 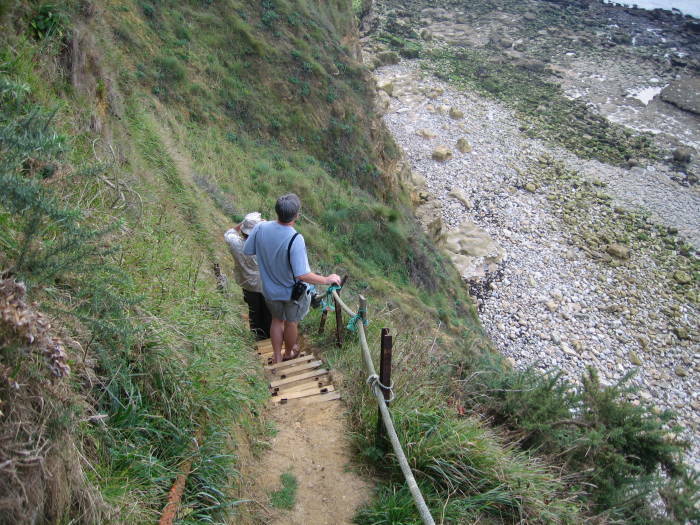 There are 30-meter cliffs along the coast between Grandcamps-Maisy and the west end of Omaha Beach, Pointe du Hoc is a small prominence along those cliffs. 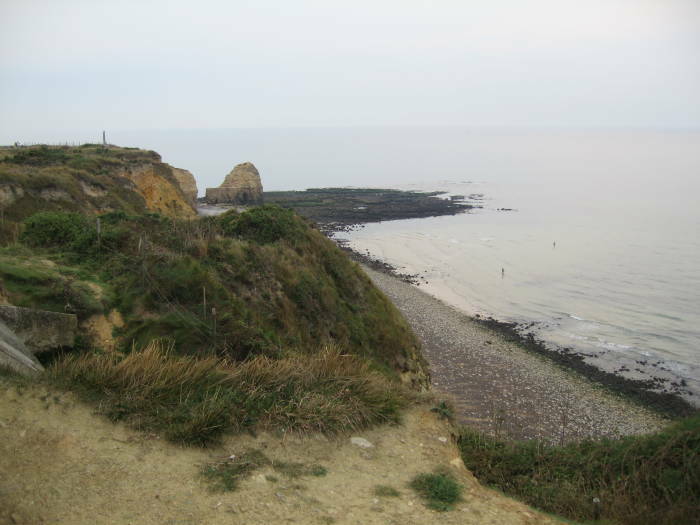 Three companies of the 2nd Ranger Battalion took Pointe du Hoc. 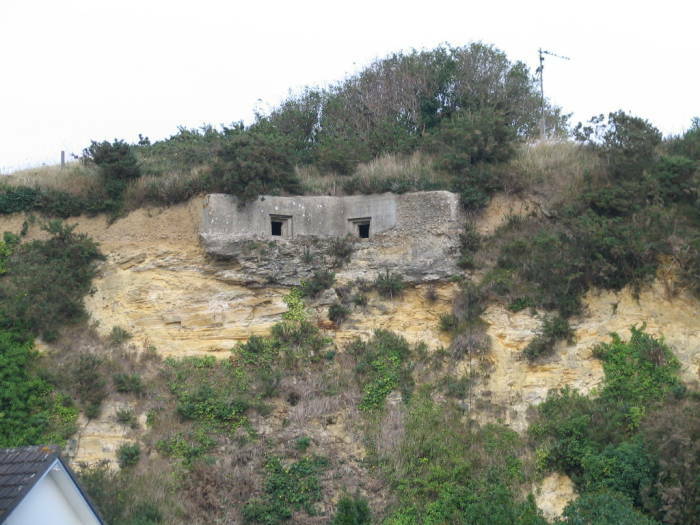 That section of the coast was heavily fortified, and many German gun bunkers were active. The Germans had more effectively placed obstacles throughout the beach, and they were difficult to impossible to clear under heavy fire. All that led to relatively high casualty rates. See Saving Private Ryan to get some very limited idea of what it must have been like. 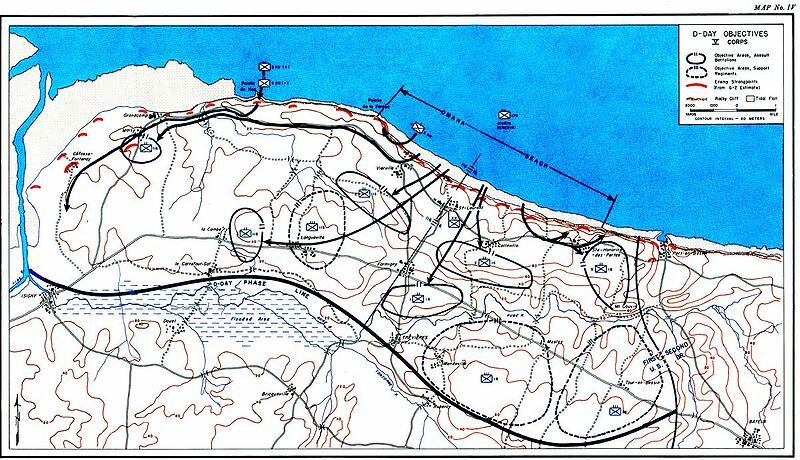 U.S. military map of the D-Day objectives around Omaha Beach. Full resolution available at Wikipedia. The 29th Infantry Division took the western half, and the 1st Infantry Division the eastern half. U.S. military map of the first wave of landings on Omaha Beach. Full resolution available at Wikipedia. Landing forces Over 34,000 men, and 3,300 vehicles. Assault craft Two transport ships, 6 LSTs (Landing Ship, Tank), 53 LCTs (Landing Craft, Tank), 5 LCI/Ls (Landing Craft Infantry, Large), 81 LCVPs ("Higgins Boats", standard landing craft), 18 LCAs (Landing Craft, Assault), 64 DUKWs (amphibious trucks, generally pronounced "ducks"), and 13 other landing craft. Assault craft were operated by U.S. Navy, U.S. Coast Guard, and Royal Navy crews. Naval support Two battleships, three cruisers, 12 destroyers, 105 other ships. Predominantly U.S. Navy, but also some Royal Navy and Free French warships. H-Hour was 06:30 BDST (British Double Summer Time). preceded by a 40-minute naval barrage and a 30-minute aerial bombardment of the beach defenses. — 05:50 H - 00:40 Naval barrage begins, continues 40 minutes until H-Hour. — 06:00 H - 00:30 Aerial barrage begins, continues 30 minutes until H-Hour. This was delayed by weather, and landing craft were already en route. In order to make sure they avoided the Allied craft, the aircraft dropped their ordnance too far inland and had little effect on the German defenses. 1st 06:30 H Most infantry disembarked from the landing craft on sandbars 50 to 100 meters beyond the water line, jumping off the ramps into water at least shoulder deep and over their heads in places. Many drowned in place there, held down by their heavy combat loads. Once they had waded in to the water line, they still had 200 meters of open beach to cross before reaching the limited cover of the sea wall beyond the shingle. 2nd 07:00 H + 00:30 The engineers in the first wave had made little progress in blowing beach obstructions, due to loss of equipment, heavy German fire, and the impossibility of blowing obstructions while your own troops are taking cover behind them or passing close by. The second wave experienced landing conditions similar to those of the first wave, and surviving members of that first wave weren't able to provide much fire support to suppress the German fire. 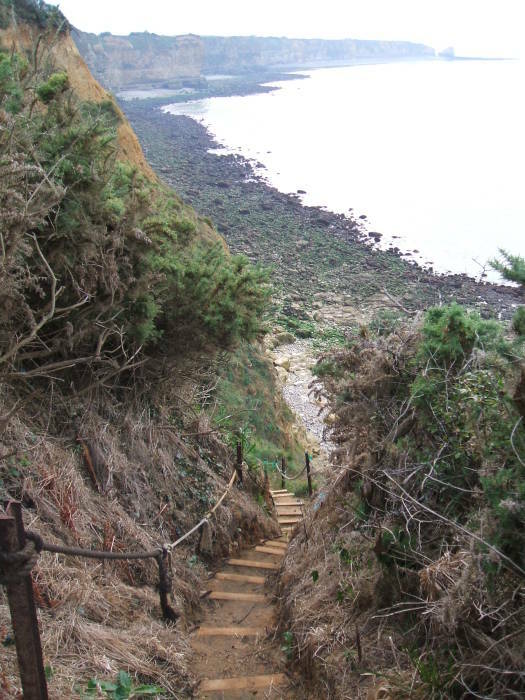 — 07:30 H + 01:00 Survivors of the 2nd Rangers scaled the cliffs near Dog White and the Vierville-sur-Mer draw. Joined later by other elements, they took the German WN-73 position defending that draw and provided an exit from the beach near Vierville-sur-Mer. — 08:00 H + 01:30 Destroyers were able to maneuver close to the beach and open fire on German gun sites. Until then the supporting artillery had been limited to the big guns of the battleships and cruisers further off shore, and they had concentrated their fire inland or at the extreme ends of the beach to avoid hitting the U.S. men. Some of the destroyers later maneuvered as close as 900 meters from the water line, their keels sometimes scraping bottom as they passed up and down the beach firing on the German positions. — 09:00 H + 02:30 More than 600 American troops were moving inland from the top of the bluff opposite Dog White. Now, on to our pictures. 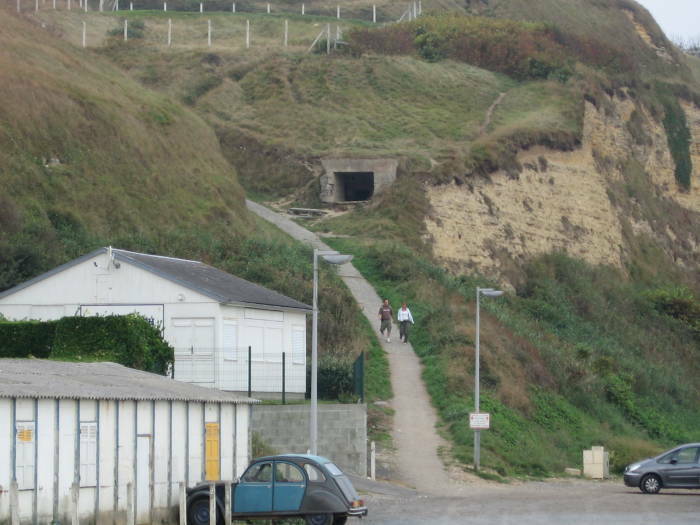 One of the main exits from Omaha Beach was the one at Saint-Laurent-sur-Mer, at the boundary between sectors Dog and Easy. The areas close to the exit paths would be heavily assaulted, as it was critical to start moving men and equipment off the beach as soon as possible to make way for following waves. A monument including the metal sculpture Les Braves is on the beach immediately opposite the draw. This section of the Normany is built up today with vacation cottages, owned by locals and many rented by Brits and occupied through the summer months. Things are quieting down by the time we visited in September. 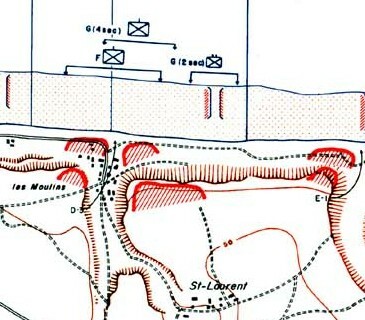 A detail of a U.S. military map of Omaha Beach, showing the village of St-Laurent on the high ground and St-Laurent-sur-Mer down the draw at the beach. 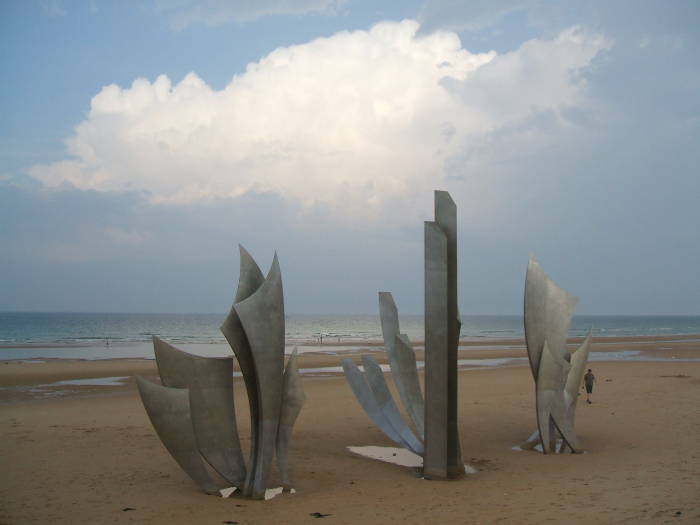 The monument on Omaha Beach at Saint-Laurent-sur-Mer. Bob, about knee deep. England is somewhere over the horizon. 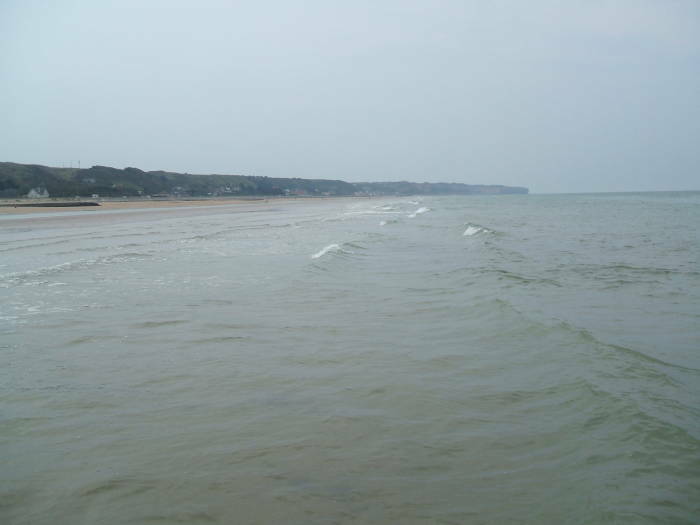 Looking southwest on Omaha Beach at Saint-Laurent-sur-Mer. 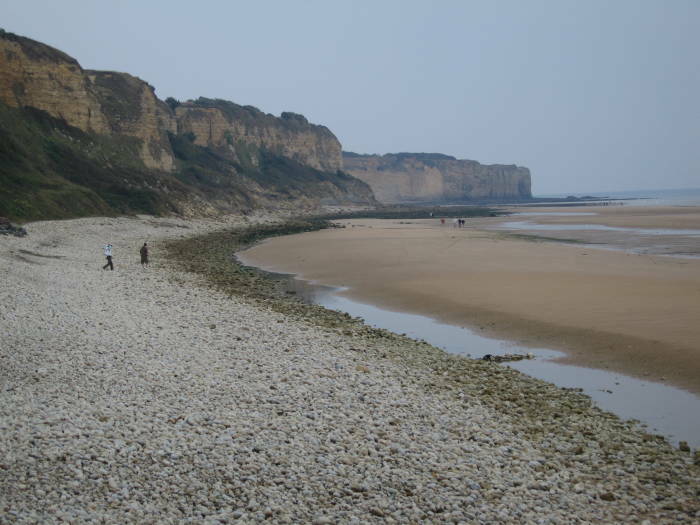 Looking west on Omaha Beach at Saint-Laurent-sur-Mer. 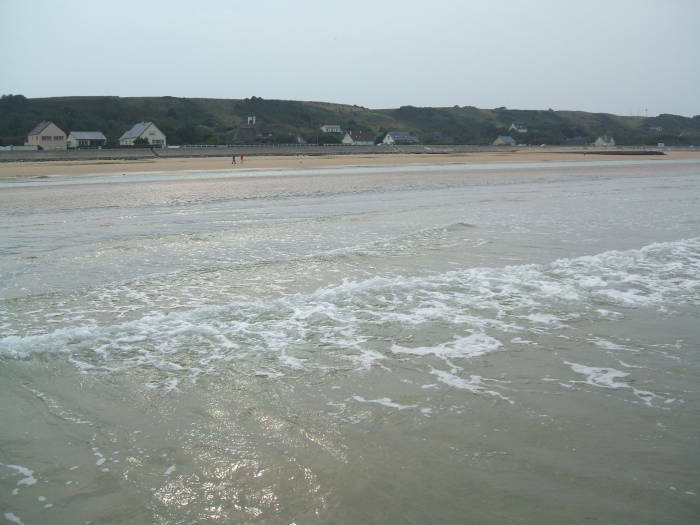 Looking east on Omaha Beach at Saint-Laurent-sur-Mer. 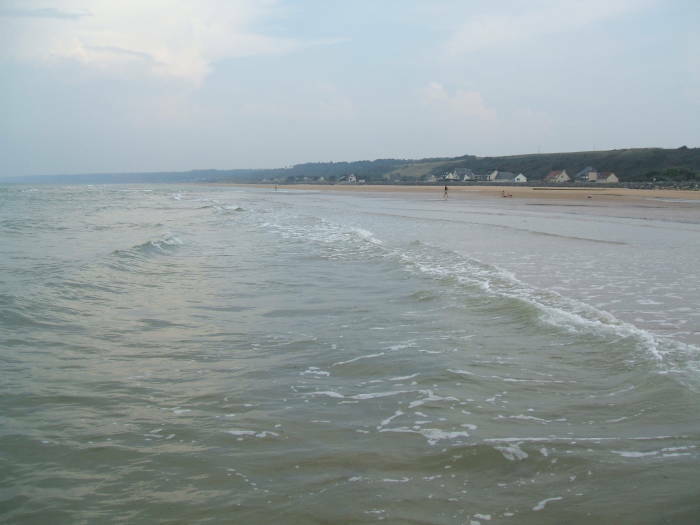 Looking southeast on Omaha Beach at Saint-Laurent-sur-Mer. 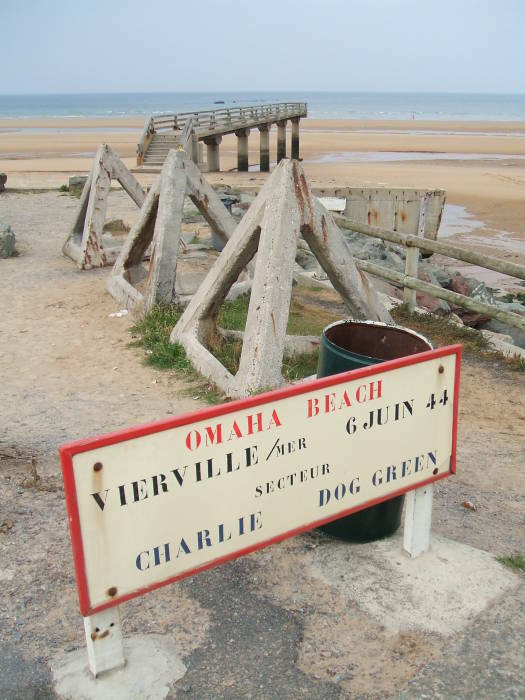 Vierville-sur-Mer was another exit, at the junction of the small sector Charlie and sector Dog near the west end of Omaha Beach. West from Vierville-sur-Mer the bluffs rose into cliffs about 30 meters high, continuing west along the coast to Pointe du Hoc. 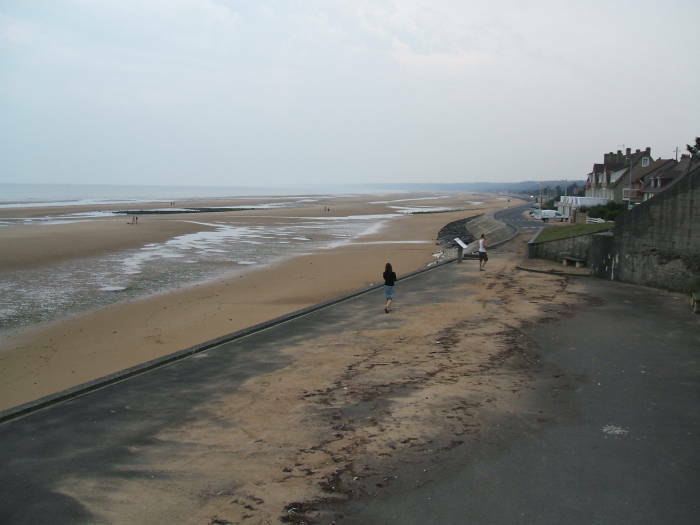 The first picture below shows the fairly broad beach with the band of shingle above it. 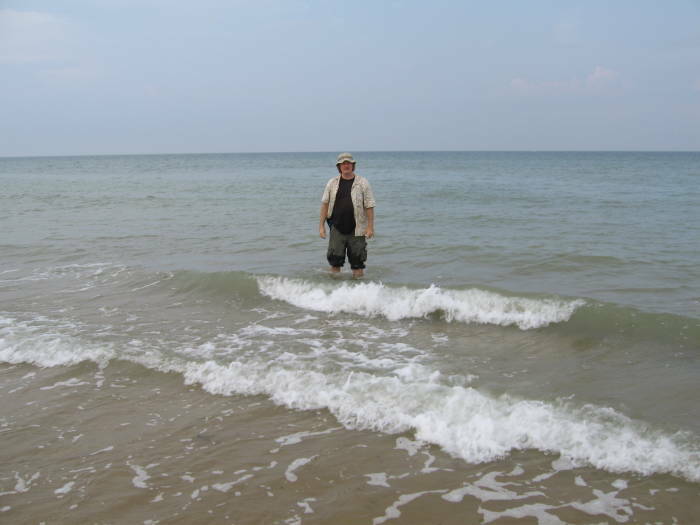 There's usually a slight dip, a narrow band of standing water at the top edge of the sand. Above this shingle in places was a sea wall, and then the bluffs rising above the beach. 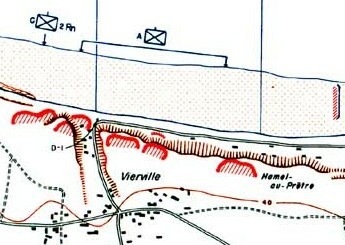 A detail of a U.S. military map of Omaha Beach, showing the village of Vierville-sur-Mer and the draw down to the beach. View west from Vierville-sur-Mer toward Pointe du Hoc, not visible here but around that next promintory. The pictures below show both the prevalence of fortified German gun sites and the difficulty of the terrain just inland from the beach. 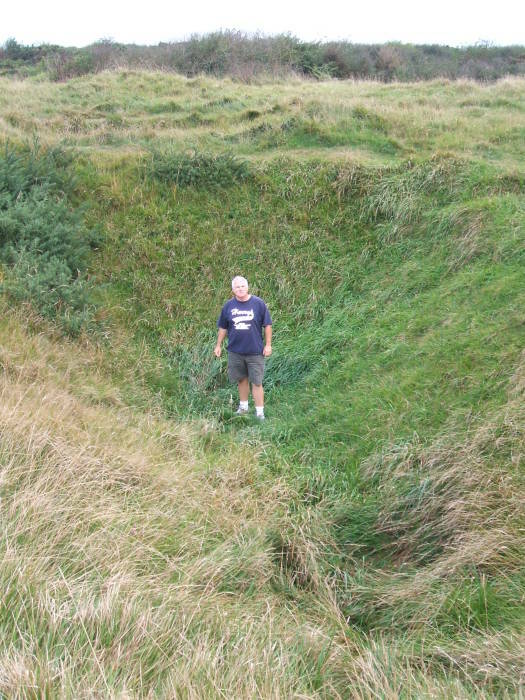 An angled bunker like those shown below allowed fire across a broad swath of the beach, while remaining largely sheltered from naval fire by the bluff itself. For plenty of details on these fortifications — armament, German nomenclature, design details, and more — see sites like bunkertours.co.uk, atlantikwall.org.uk, and atlantikwall.co.uk. German gun site overlooking Omaha Beach. 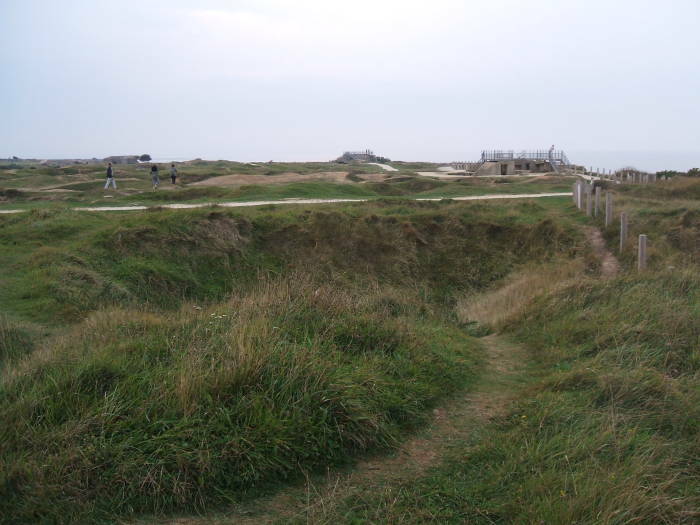 Pointe du Hoc is a prominent point along the cliffs between Omaha Beach and Utah Beach. 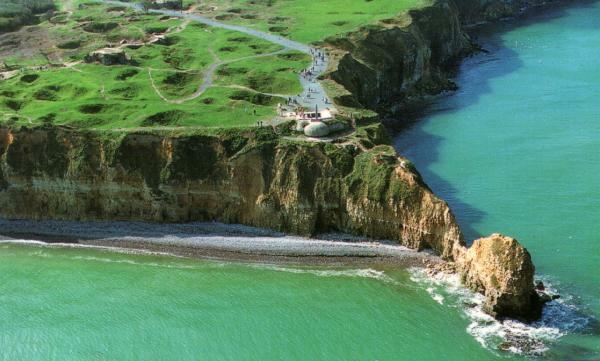 Pointe du Hoc is the local name, in Norman French. Parisian French renders this as Pointe du Hoe and the U.S. maps at the time used the Parisian rather than the local nomenclature, as seen in this map. 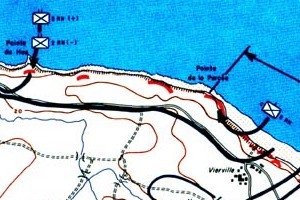 Part of a U.S. military map of Omaha Beach, covering from Pointe du Hoc to Vierville-sur-Mer. 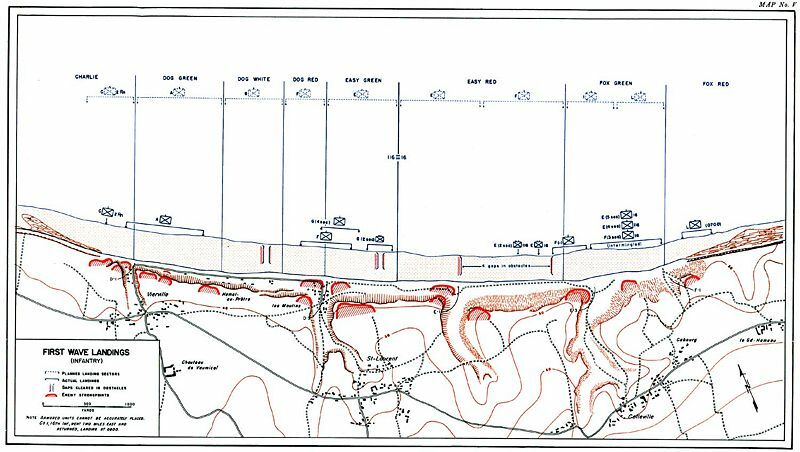 U.S. military map of the planned assault at Pointe du Hoc by the 2nd Rangers Battalion. 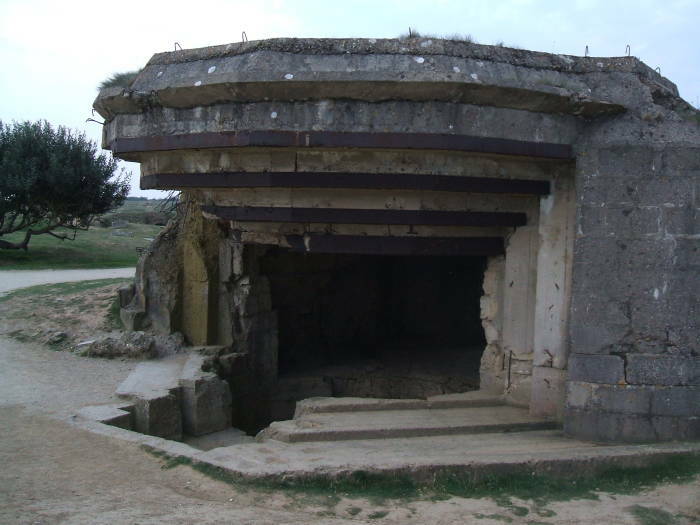 The Germans had built six large casemates housing captured French 155 mm guns. See the bold circles on the detailed map. There were also fortified observation posts for controlling the fire of those guns. Any landing forces off either Omaha or Utah beach would be within range of these guns visible from the observation posts. The site was heavily fortified inland. See the multiple layers of fencing and mine fields on the map. The plan was for the U.S. 2nd Ranger Battalion to be landed on the shingle at the base, climb the 30-meter cliffs while under fire, and take the fortified site at the top of the cliff. The Germans happened to remove the guns just before the landings. They last gun was removed on 4 June, just one day before the planned landing and two days before the actual date. While the guns were no longer there, it would still be a deadly force as an observation and gun-control point for the relocated guns, and so it still had to be taken. Free French forces had reported through their intelligence channels that the guns were being relocated, and the 2nd Ranger commander, Major Cleveland A Lytle, became quite vocal that the assault would now be an unneccesary risk. He was replaced (and went on to earn a Distinguished Service Cross for his actions with the 90th Infantry Division) and the assault went on. However, only a few of the commanding officers in the assault force knew about the change. The Rangers managed to take Pointe du Hoc with only limited casualities. 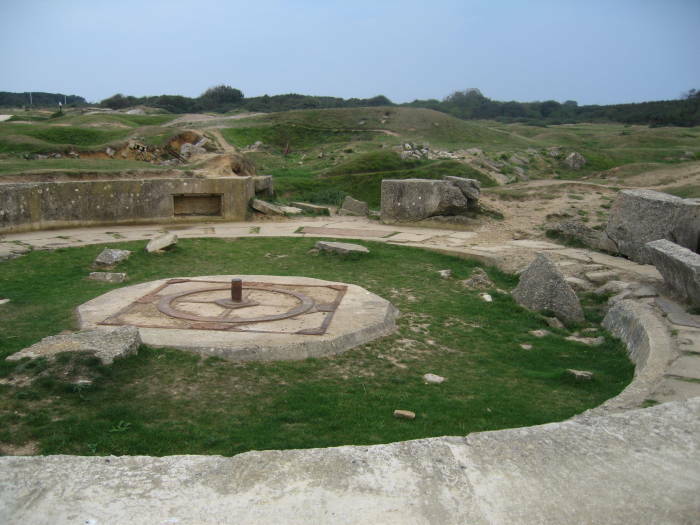 Discovering that the guns were missing, a small patrol then set off cross-country to their new location, a little way inland and overlooking Utah Beach, and captured and destroyed the guns using thermite grenades. 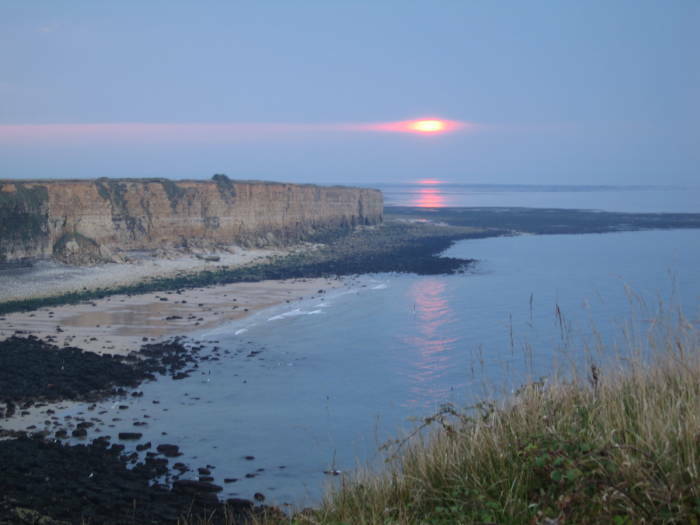 We drove toward Pointe du Hoc from Vierville-sur-Mer, leaving the main road to go to the cliff tops between Omaha Beach and Pointe du Hoc. The cliffs aren't solid rock, it's at best what climbers might refer to as choss — more like a hard aggregate of stones and soil. This would be dicy stuff to climb on a good day, never mind when you have to deal with a bunch of Germans shooting down the cliff and lobbing grenades at you. A friendly sign now points the way to a path down to the shingled shore. Pointe du Hoc is visible in the distance, it's the point of land with an isolated rock in the distance in the following pictures. 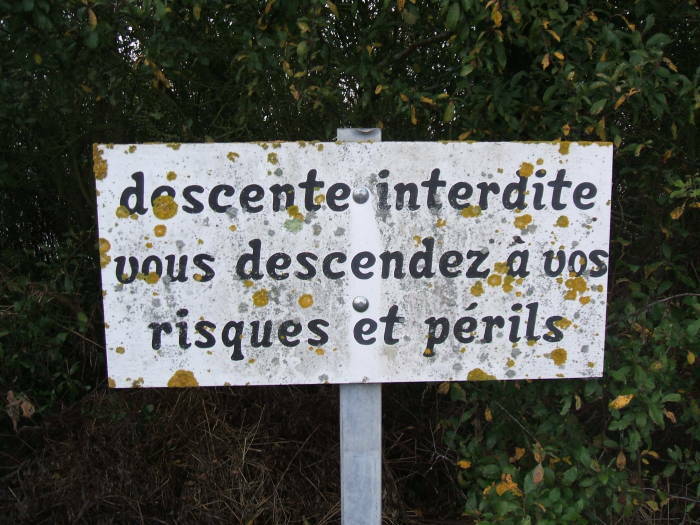 vous descendez a vos risques et perils. enjoy your visit to the beach. 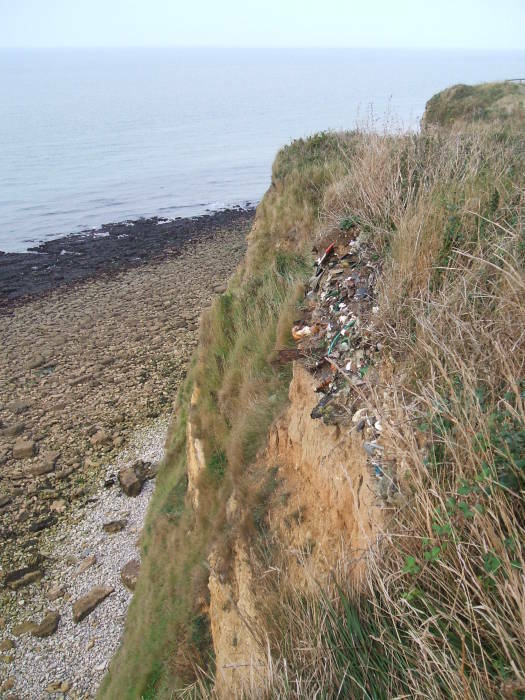 Chossy cliffs near Pointe du Hoc. The path down to the shingle. Descending to the shingled beach. 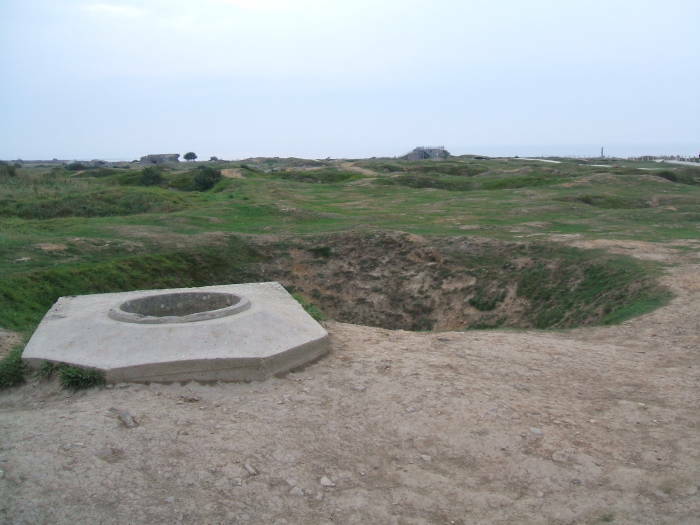 Pointe du Hoc is that narrow point of land in the distance. 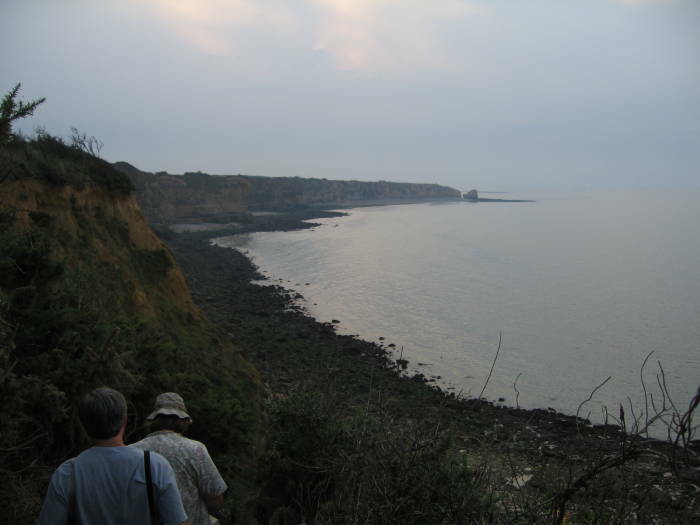 We looked around there, then returned to our van and drove to Pointe du Hoc. Between the aerial and naval bombardment, followed by demolition work, and then several decades without maintenance, the site is pretty well wrecked. 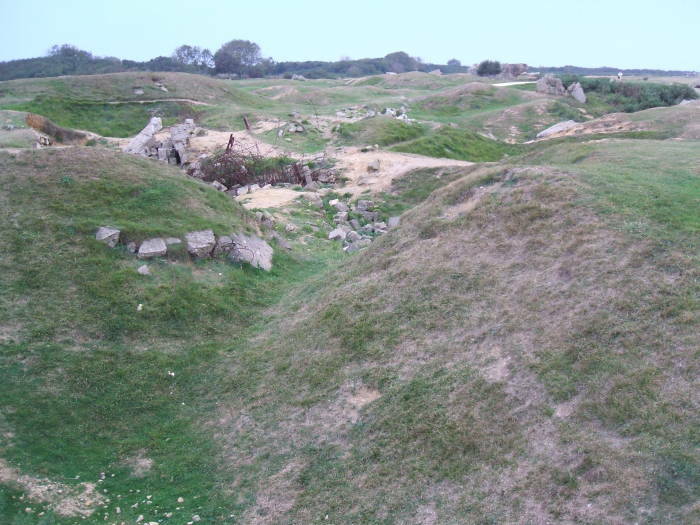 Shell craters at Pointe du Hoc. Jeff investigates a shell crater. 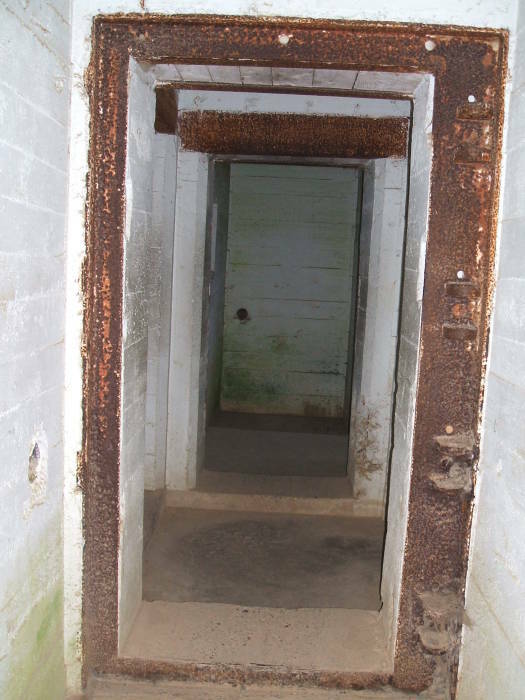 Bunker interior. More concrete and steel. Destroyed large German gun site. The chossy cliffs are eroding, so the cliff faces are constantly moving back as they are cut away by winter storms. A monument placed where Ronald Reagan famously gave a speech on the 40th anniversary, 6 June 1984, is now fenced off and inaccessible as that part of the cliff is about to disappear. Compare the first picture, below from a postcard photographed maybe in the 1990s, to the situation when we visited, in the second picture. That rock that is now isolated was connected to the point a few years ago. Pointe du Hoc before erosion closed the monument, a scan of a postcard. As for books not to read to prepare for a visit, I would recommend avoiding The Boys of Pointe du Hoc by Douglas Brinkley. I bought it remaindered for one dollar and still felt like I got ripped off. The title and back cover material misled me into thinking that it was about the Ranger assualt on Pointe du Hoc. No, there's just a very short summary of the action and then the rest is an overwrought panegyric to Ronald Reagan. Brinkley writes as though Reagan wrote that speech. Peggy Noonan wrote the speech, Reagan presented it. It's like crediting Humphrey Bogart for the excellent writing of The Big Sleep — Raymond Chandler wrote the book, Bogart acted in a movie based on it. Brinkley's book should have been titled A Speech Peggy Noonan Wrote In 1984. Some Reagan zealots lose all sense. The result can be ridiculous, like how they got a newly built gigantic building stuffed full of random ill-fitting government bureaucracies named in honor of Reagan. Uh, that's the complete opposite of what he said he wanted. Why don't they build a Franklin Roosevelt Jogging Track while they're at it? Sunset over Utah Beach as seen from Pointe du Hoc. 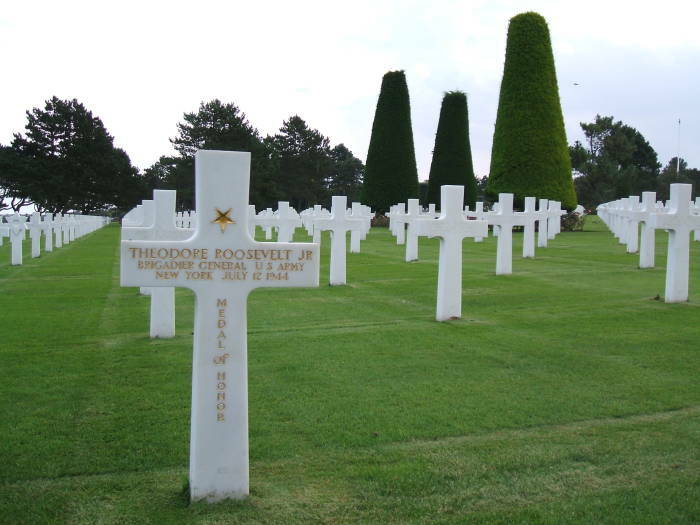 The biggest American cemetery is at Colleville-sur-Mer, toward the east end of Omaha Beach. It's very moving. British cemeteries are smaller and more numerous, designed very differently and also very moving. While the American ones are very formal and uniform, the families of the British dead designed their stones and their inscriptions. 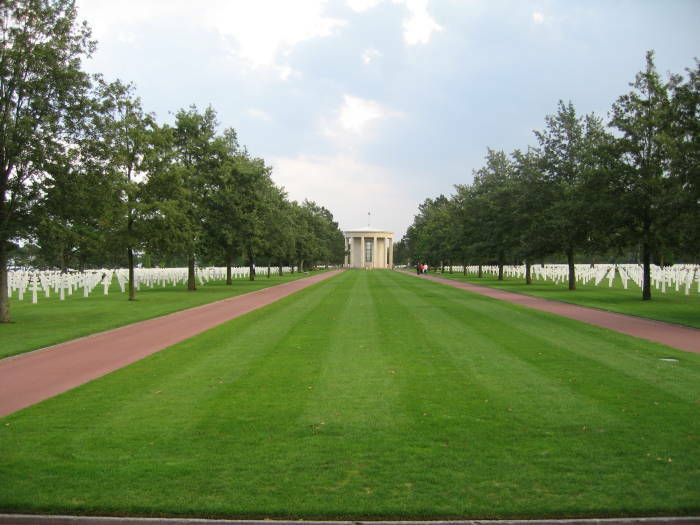 The American cemeteries show the scale of the sacrifice, the British and other Allied ones show the humanity. The visitors' books at all the Allied cemeteries are full of inscriptions from mourning families, and heartfelt thanks from people of many nationalities. 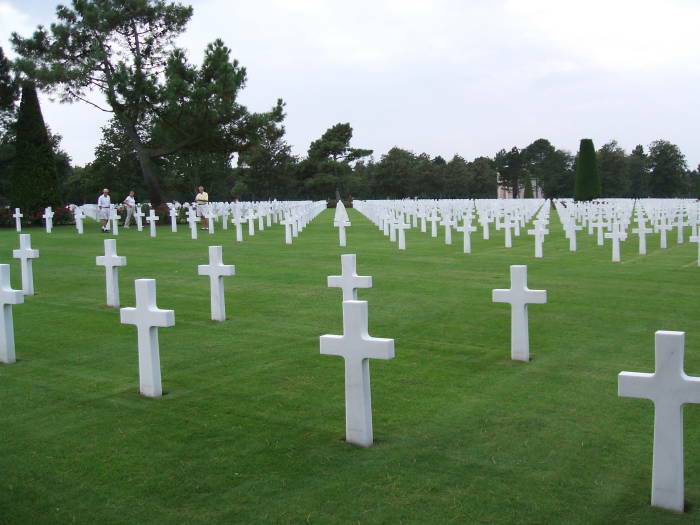 The American cemetery at Colleville-sur-Mer. The grave of Brigadier General Theodore R. Roosevelt Jr. There are also a number of German cemeteries in Normandy. The visitors' books at those tend to have inscriptions written by Germans, in English. They lament the awfulness of war in general, as though the Second World War was the result of some abstract outside force rather than something Germany started. Well, Germany also marched into Russia, in 1941, despite Napoleon's spectacular illustration in 1812 of just how stupid it is to march on Moscow, and despite the debacle long before that in 1242 when the Teutonic Knights were soundly defeated by Aleksandr Nevsky.